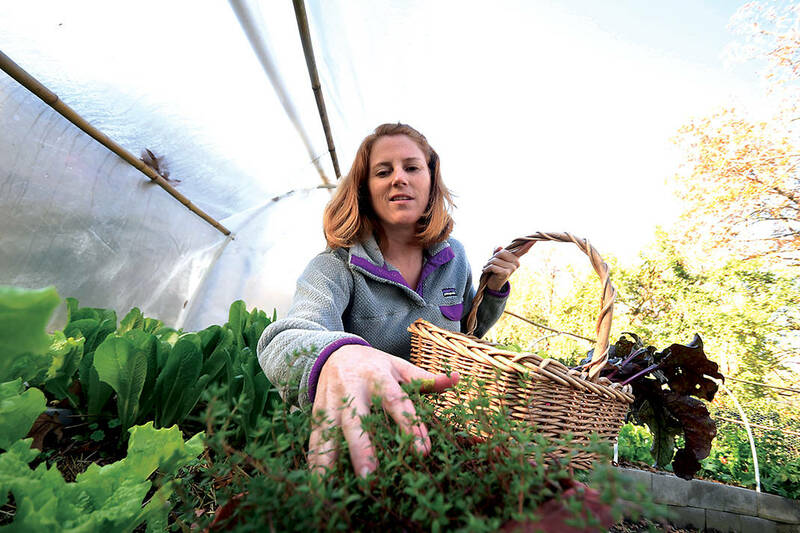 Jennifer Walls runs her fingers through thyme growing in the garden at her Tyner home. 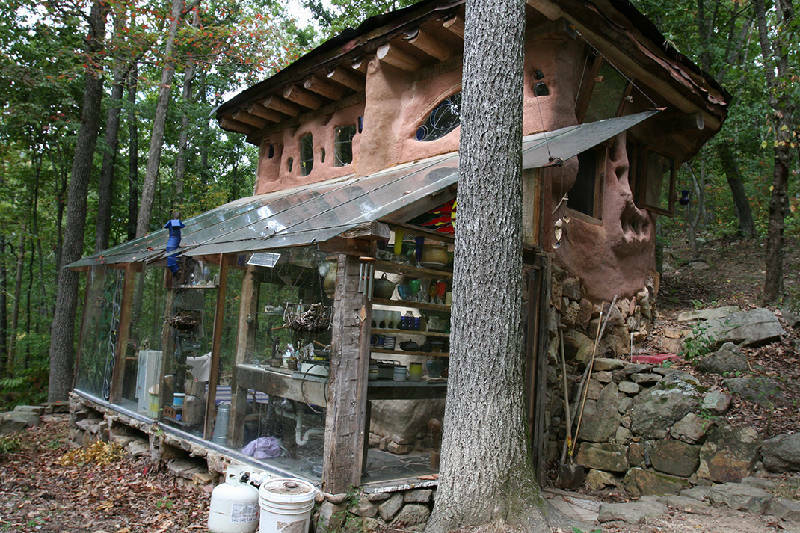 When Jennifer Walls told her grandmother she dreamt of one day living in a cob house, an earthen structure built with a mixture of clay, sand and straw, her grandmother said what most who have never considered a life of voluntary simplicity might have thought. "You want to live in a mud hut?" Walls' grandmother had lived a tough life in rural West Virginia before a whirlwind romance whisked her off to the comforts of Orlando, Florida. For her, the idea of living off the land was regression. But for her 42-year-old granddaughter and a handful of other Chattanoogans charmed by the modern homesteading movement, the prospect of growing one's own food, making one's own household products and building one's own home from local materials is more than a dream. It's the gateway to a better future. This cob house at the Sequatchie Valley Institute utilizes the sun's energy to heat it during the day. The house is built from all natural materials. Broadly defined as a lifestyle of self-sufficiency, "homesteading" is a buzzword that's been reduced, reused and recycled several times over the past few decades. The term made its first appearance in history books with the Homestead Act of 1862, which granted a small plot of federal land out West to any settler willing to live on and farm it for at least five years. The promise of free land brought life to the slow-growing western frontier, continuing to draw applicants until most of the land suitable for agriculture was inhabited. The act was phased out in 1976, but the ideals of self-sufficiency kept cropping up among younger generations. 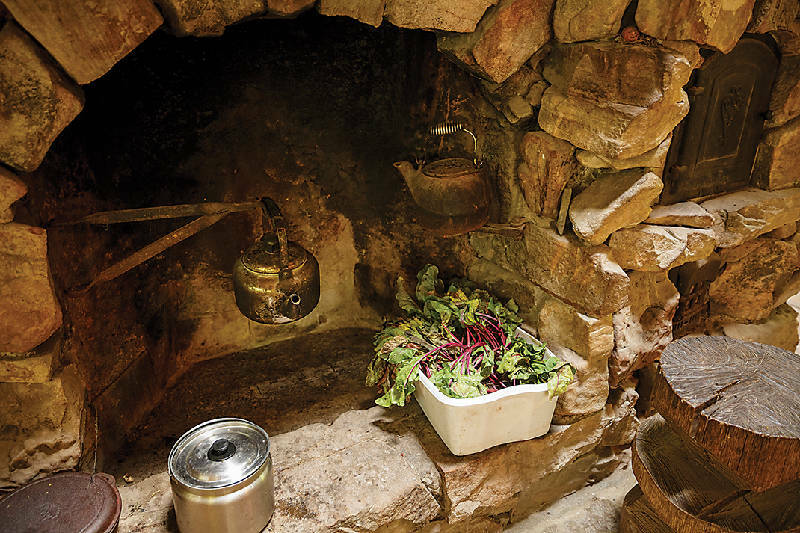 In the 1940s, the concept of homesteading gained a new following when the term was used by those giving up their city lives and learning to live off the land in an attempt to escape the "rat race," says Carol Kimmons, 77, who has been homesteading at the Sequatchie Valley Institute with her husband, Johnny, for 40 years. "They wanted to leave the cliche struggle of an 8-to-5, Monday through Friday [job], working to get by and not really feeling life," says Carol, who serves as director of education at the sustainable-lifestyle learning center. A few decades later, the term was embraced by free spirits in the 1970s. This time, however, its popularity was fueled by the desire to rebel against the standard American dream, while also evading toxins like pesticides and synthetic fertilizers that could harm the environment. "We definitely bit into that," says Johnny Kimmons, 77, who started the institute, more casually known as Moonshadow, with Carol in 1971. "We knew that we didn't want chemicals in our gardens that we were going to do; we knew we didn't want chemicals getting into our kids and us." Today, the concept of homesteading is tied closely to do-it-yourself culture and growing knowledge about food's effect on the body. But not all homesteaders' properties look like the Kimmons' 300-acre mountainside paradise, which is decked out with a massive array of sunlight-tracking solar panels, an edible landscape incorporating food plants into the surrounding forest, and handcrafted structures in which visitors can meet and reside. Over the last few years, Chattanooga, like other cities, has seen a rise in urban homesteaders, who have already begun taking steps toward a life less dependent on the outside world. From the confines of their apartments, city dwellers have set up backyard or container gardens, started canning their food for preservation, explored ways to reduce their energy consumption and lobbied for chickens to be allowed within city limits. "People are ready to start living their dream now," says Patrick Ironwood-Kimmons, 51, Johnny and Carol's son, who traveled to study the effects of technology and agriculture on society before moving back to Moonshadow. "They don't want to wait until they retire at 65 to live the dream." Ironically, one of the forces behind homesteading's resurgence is the internet, Patrick notes. When his parents started building their Sequatchie Valley home, most of their "how-to" information came from books in Chattanooga's downtown public library. "Now everybody has access to everything," Patrick says. "If you want to know a better way to plant tomatoes or keep your house from rotting now it's just a matter of slogging through too much information and trying to figure out what to believe." While the primary objective of farming is to produce enough goods to sell, in homesteading, the primary objective is to produce enough only for the family or community living on the land. Still, some might have been lured to the homesteading lifestyle by the possibility of profit, Carol says. With the growing demand for organic meat far outweighing the supply, the enterprise could be a true money-maker, she says. Walls, however, says one of the biggest attractors she's seen among her circle of rural and urban colleagues is a desire to engage simply and directly with life in a mindful way, no matter their location. 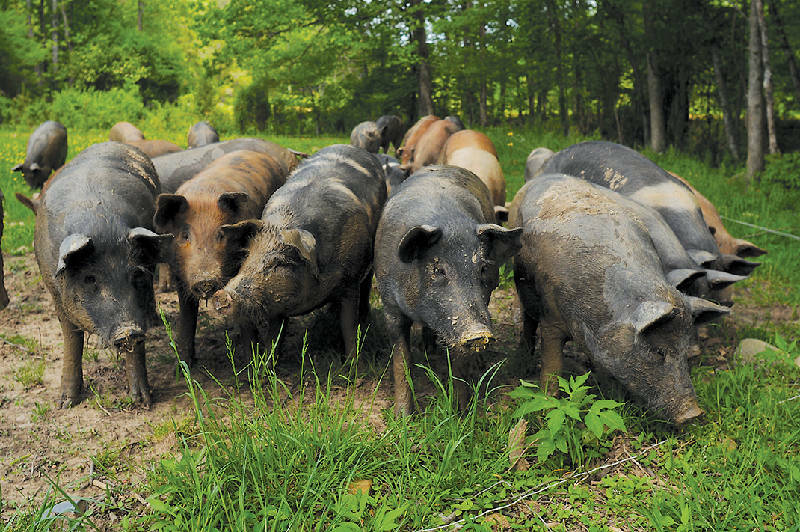 Pigs roam the land at Sequatchie Cove Farm, which is owned by homesteader-turned-sustainable-farmer Bill Keener. In an age when even the most basic grocery items come with a host of unpronounceable chemicals, Walls says one of the greatest selling points for a life of self-sufficiency is knowing exactly where each meal came from and exactly what's in it. When she isn't daydreaming about her future cob house or the cooperative rural community she hopes to one day establish, Walls is hard at work in the communal garden behind her Tyner home. With help from like-minded neighbors, the urban homesteader is able to produce a colorful variety of truly organic fruits and veggies, from strawberries and grapes to okra and carrots. But the benefits of having a more intimate relationship with the food on her plate transcends pesticide-free produce, Walls says. Over the last few years, Walls has learned how to make her own yogurt, mayonnaise and whipped cream from scratch in her pursuit of increased self-dependence, and the all-natural diet has certainly paid off. "You can literally feel the difference in your body," Walls says. "When you know how something was made and you know what's in it you can feel a difference in how it's assimilated. It brings you closer to your body." As a mother of four, fellow homesteader Katherine Merryfield, 37, is just as thoughtful about what goes into her children's stomachs, but the lifestyle has also allowed her to be mindful of what's absorbed through their skin. In the Merryfield family's Sequatchie Valley home, guests will likely find homemade soaps, homemade shampoo and homemade laundry detergent, all free of harmful ingredients. Had the visitors popped by when her kids, now ages 11 through 19, were younger, they would have also caught a glimpse of cloth diapers. "The cloth diapering I absolutely loved," says Merryfield, who started her homesteading efforts in 2006. "My [younger] kids never had the diaper rashes my older kids did have when we were just using regular diapers. So I knew exactly what was going on my babies." The theme of homesteaders feeling more connected to the processes of life translates to many feeling more engaged with the world around them. They share a more meaningful relationship with their possessions as they self-repair damaged equipment, transform trash into functional or artistic treasures and build homes that weather storms — as Merryfield knows all too well from the tornado that only managed to take one window from her hand-built home. Homesteaders also share a more meaningful relationship with what they buy or barter from other local practitioners, says Walls. Decorative crafts like the leaf-imprinted bird feeders sold at Moonshadow usually come with a face-to-face conversation with the artist (Carol Kimmons, in this case). And each egg or pound of meat acquired from local farms comes with the knowledge that the seller feeds his or her family the same quality food. Still, sometimes that "simple" life isn't so simple. The first time Merryfield's family killed a chicken, Katherine cried. "It was the first time you realize what you're doing," she says. "You realize, I'm not just eating a vegetable. I'm not just eating something that comes from a store. I'm eating a life." After sparing a few of the chickens' lives, however, Merryfield says she realized why some animals were eaten. Once their slaughter date had come and gone, the legs on some of those chickens, bred to be meaty, began to buckle under their weight. Other chickens dropped dead when their hearts gave out. "It's a mercy kill," she says. Now, the focus is on giving each of the chickens that stay on the farm a happy, natural life, complete with plenty of sunshine and room to roam. Then, at dinner time, Merryfield and her family bow their heads to say thanks for the life they know is being transferred to their bodies. Greens sit in a container at a cooking fire in the home of Carol and Johnny Kimmons at the Sequatchie Valley Institute. The non-profit&#x2019;s self-guided nature trails are available to the public on the weekends. Homesteading is not as easy or as glamorous as those who romanticize the concept would have you believe, Merryfield is quick to point out. At times it can be an absolute nightmare, she says. The first winter the Merryfields spent living off the grid was brutal. The family had been using a wood-burning cook stove to heat their yurt, and while it kept them toasty for most of the season, they quickly learned how inefficient it could be when the temperature dropped. With poor insulation and plastic sheeting for windows, the little bit of heat generated seeped out of the dwelling, leaving Merryfield and her four children at the mercy of the cold. Eventually, everything in their home froze over, and the mother had no choice but to abandon ship. "I couldn't, for the life of me, get a fire going," says Merryfield, whose husband, Brian, had been traveling at the time. "So I had to just pack up the kids and say, 'OK, we've got to go somewhere else for right now.'" Looking back, she can laugh at the situation, especially since the family got a secondary heat stove to help keep them nice and warm the following winter. But it's those kinds of trials that can bring a fledgling homesteader's experience to an end. "A lot of people give up," Carol Kimmons says. "The number one thing that a lot of people don't realize when they start doing it is that it takes a lot of hard work and, in a lot of cases, deprivation. You're not going to live in a fine brick house with three baths and a half; it's going to be a struggle." Tip #2: Turn off your electricity. If you're planning to go off the grid, try living without electricity first. The experiment will reveal problems you might not have realized you'd need a solution for, like alternative ways to refrigerate your food or how to make due without refrigeration. Tip #3: Decide how self-sufficient you want to be. There's a point at which homesteading is more hassle than it's worth, Walls admits. The goal is to find a balance between "makes me feel closer to real life" and "too much hassle," then slowly build up your tolerance as you amass more and more skills, she says. Tip #4: Meet other homesteaders. » Join homestead-related Facebook groups. » Network in person during events at places like Crabtree Farms. » Volunteer at community gardens nearby. Tip #5: Replace what you buy with what you can make. Just another option to consider if you're hoping to head out to the country. Your wallet will thank you. Tip #6: Visit other homesteaders' properties. And don't be afraid to ask tough questions. You'll want to learn all you can about what to expect should you decide to snag your own piece of land and give the rural life a go for real. "If you can't homestead in the city, where everything's easy to get, you'll never be able to make it in the country," says Merryfield, recounting a valuable piece of advice given to her by a friend. Tip #8: Pick one thing. Fortunately, the Kimmons were able to survive their early years on the Sequatchie Valley property with help from their parents, who were strong supporters of their lifestyle. Carol's parents were "true hillbillies" from Tellico Plains, she says, and Johnny's parents lived on a ranch in New Mexico, having traveled there by covered wagon. The in-laws were well-acquainted with the rigors of country living, and were always willing to offer construction advice, bring tools or get their hands dirty as the young couple tested the waters of self-sufficiency. Carol's father even bought the land on which Moonshadow now sits, preventing the couple from falling into debt, like other overzealous homesteaders have. "Our parents loved what we were doing, so we always had their backing," Johnny says. The Merryfields, on the other hand, weren't quite so lucky. When the family first began homesteading on their 1-acre property just outside Atlanta in 2006, Merryfield quickly started losing friends. "They couldn't understand why it was a big deal," she says. "They felt like we were trying to challenge their lifestyle as being something that wasn't OK, which was never our mission at all." Though the family found new support through the kindness of neighbors, their journey has not been without its struggles — especially for the four Merryfield children, says Katherine. When droughts forced the family's 275-gallon rainwater harvesting system to run dry or built-up pollen in the pipes left them without running water, the family would have to make tough decisions. They couldn't do laundry without traveling 20 miles to the nearest laundromat, and they had to send the kids off to a friend's to take a shower. The children, whom Merryfield home-schools, also had a harder time making friends, she notes. Many nearby kids, it seemed, weren't eager to hang out in a house with no television, no electricity and toilets that didn't flush. "There were days when I lived in guilt because of what society had told me they should have," Merryfield admits. But when the family lost the 77-acre property they'd moved to in 2012 this July, largely due to a legal dispute amongst its co-owners, Merryfield was once again reminded just how dedicated her young homesteaders were to the lifestyle. "It was unanimous," she says of her children's decision when confronted with the option of moving back to the city. "My kids told me, 'You guys can leave, but we're gonna figure out some way to stay. So we hope that you want to stay, too.'" Today, the family has settled onto their new, 20-acre property in Whitwell, Tennessee, just 2 and a half miles from their former land. Though they've managed to weather through blood, sweat and tears, Merryfield pulls no punches as one of the instructors at the Sequatchie School for Self Reliance and Survival Skills, which teaches classes about everything from disaster preparation to trauma medication in addition to traditional homesteading skills. She tells wannabe homesteaders that it's going to be tough. That it'll bring them to their lowest point. That it'll challenge their character and test their resolve. And that it will be the biggest adventure of their lives. "We didn't expect everything it was going to take from us, yet look at everything that it's given us," Merryfield says. "It's given us something real. It's given us a story to tell when we're old. I don't know that we would have had that otherwise."